Valencia CF president Manuel Llorente confirmed that Aduriz will be sold this summer, he is going to be sold to Atletic Bilbao who are said to sell their star player Llorente to Real Madrid and are looking for a replacement. 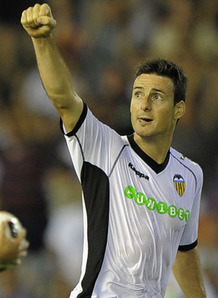 Aduriz is a similar style player with great headers and big presence in the area, so he is the perfect choice for them. Valencia CF is not really impressed with his goalscoring tally and is looking to make as much money from him and then go for Gameiro. The president said that Valencia CF are going to try really hard to sign Kevin Gameiro and are even likely to offer 12 million euros for the forward. EDIT: Happy Aprils fools day. Yes people this was a Aprils fools day joke. Its not real.